A beautiful, tropical home near Layan beach in Phuket, Villa Paradise lives up to its name with vibrant flora engulfing its periphery, luscious gardens fresh with the morning dew, and a private swimming pool that calls out your name as soon as you’re outdoors. The three-bedroom villa offers a peaceful retreat and sanctuary to guests for absolute relaxation and rest, so you can leave feeling rejuvenated with all your energy restored. Traditional Thai architecture and rustic living greets you at the villa, for a complete experience where you get to enjoy something real! 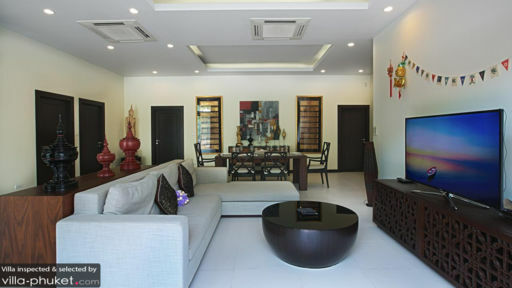 The three bedrooms at Villa Paradise are designed for homely comfort with double beds in two rooms and singles in one. They are decorated with elegant flair featuring simple colours, selective artwork, and a cosy vibe. With vanities and mirrors for your convenience, you can store all your belongings with ease. There are en-suite bathrooms accompanying each bedroom with amenities for your comfort and ease. With walled gardens shielding the villa and affording guests the privacy they deserve, Villa Paradise makes sure that everyone is comfortable and free to do as they please. The periphery is fringed by tropical flora including a variety of trees, plants, and blooming flowers. There is a 10-metre swimming pool that resides in the middle of the garden, perfect for a swim at any time of the day! Once you’ve had your fill, it is time to kick back and relax on one of the many sun loungers found beside the pool on the deck. They have been placed there for you to stretch your muscles or simply to doze off. The old-world charm is quite apparent in the living room at Villa Paradise with antique furniture, muted hues, and a quaint quality to it. You are sure to feel well-rested and relaxed once you’re relaxing in this communal space. The comfortable sofas are the ideal spot for everyone to gather around and chat about old times and times to come. A TV is in place as well, in case you wish to watch a few movies. The air-conditioned living room is not the only place for everyone to hang out together, there is even a dining area and kitchen with a six-seater dining table for endless meals and exciting moments. The kitchen is fully-equipped with everything you could have a use for to cook up a storm including an electric kettle and a toaster. Villa Paradise provides guests with plenty of special services and amenities to make their stay easygoing and smooth. As a private residence, the villa is definitely a home if you wish to make it one. You can do as you please, cook your own meals, live for an extended period and enjoy the serenity of this region taking your own time! There is free WiFi, 24h security, and modern comforts as well. For complete and utter relaxation, Villa Paradise would be the ideal choice as not only 3km away is the Laguna Phuket Golf Club. There are several places of interest you may wish to visit including Bang Tao Temple, Khao Phra National Park, Bliss beach club, and others!